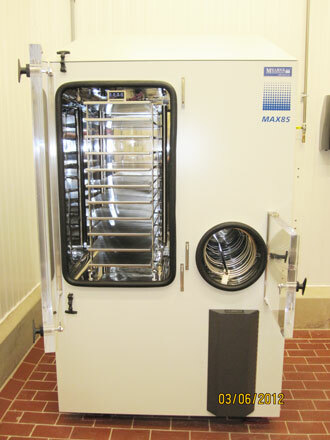 Spear Products now offers contract Lyophilization using our 20 ft², 10 shelf bulk freeze dryer. Pharmaceutical and medical device companies often use freeze-drying to increase the shelf life of products. By removing the moisture, the material can be easily stored, shipped, and later reconstituted to its original form. Most materials are dried with approximately 1% to 5% moisture remaining causing a tremendous reduction in weight and volume. Dry formulations are particularly well suited to formulating sensitive biological materials, and are required for use with modern drug delivery technologies. Freeze drying preserves the form and shape of materials that may be used for wound care, stints, patches, etc. that are rehydrated by wound fluids.